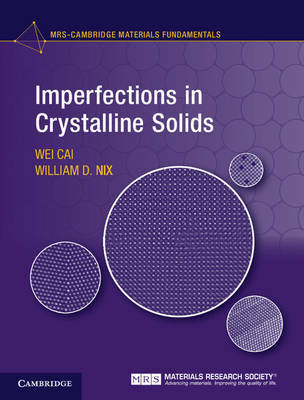 Author(s) Cai, Wei; Nix, William D.
This textbook provides students with a complete working knowledge of the properties of imperfections in crystalline solids. Readers will learn how to apply the fundamental principles of mechanics and thermodynamics to defect properties in materials science, gaining all the knowledge and tools needed to put this into practice in their own research. Beginning with an introduction to defects and a brief review of basic elasticity theory and statistical thermodynamics, the authors go on to guide the reader in a step-by-step way through point, line, and planar defects, with an emphasis on their structural, thermodynamic, and kinetic properties. Numerous end-of-chapter exercises enable students to put their knowledge into practice, and with solutions for instructors and MATLAB® programs available online, this is an essential text for advanced undergraduate and introductory graduate courses in crystal defects, as well as being ideal for self-study.